Behat is a behaviour driven development framework for the PHP application. Behat can be used for acceptance testing and api testing. Guzzle is PHP HTTP client to work with HTTP and web services. You can read more about Guzzle on the official website . We can use combination of the Behat and Guzzle for the testing of the REST API. In this post, we will see how to use Guzzle http for testing GitHub web services. Let’s do some action now. We will install behat, create feature simple file and implement step definitions. Let’s create our composer.json to install all the dependencies with composer. This will install all the dependencies in the ‘vendor’ directory. Now we will create config file for behat. Note, we have created basic config for the behat. Now initialise Behat so that, Behat will create ‘bootstrap’ directory and ‘FeatureContext.php’ file. 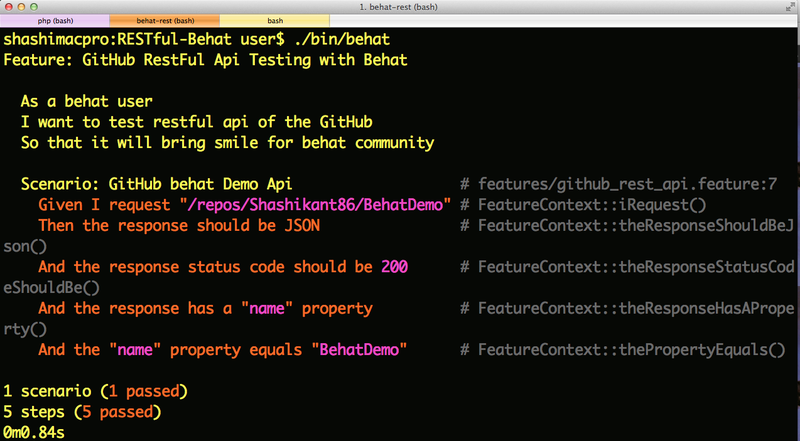 $ vim github_rest_api.feature Feature: GitHub RestFul Api Testing with Behat As a behat user I want to test restful api of the GitHub So that it will bring smile for behat community Scenario: GitHub behat Demo Api Given I request "/repos/Shashikant86/BehatDemo" Then the response should be JSON And the response status code should be 200 And the response has a "name" property And the "name" property equals "BehatDemo"
And the "name" property equals "BehatDemo"
As we read the feature file, we can understand that we are checking response format, response code and properties of the response a.k.a response body. At this point, we need to run ‘behat’ to get undefined steps. We need to implement these steps in the ‘FeatureContext.php’ file. Now, it’s time to implement step definitions using all the methods of the Guzzle Http library. throw new \Exception('HTTP code does not match '.$httpStatus.